With the blues finding ever greater audiences, first-rate blues bands are turning up in a lot of locales not normally thought of as meccas for the great American music form. The past couple of years have seen a lot of excellent albums from blues performers from all over the country -- this album review series has spotlighted recordings by groups from Washington, DC, Portland, Oregon, Birmingham, Alabama, and a few years back, Vancouver, Canada. And of course, listeners to our Homegrown Music series know that there are plenty of fine blues players right here in Eastern Pennsylvania. This time we go very far afield -- to a blues band from Australia called the Mighty Reapers, whose new release is entitled Trouble People. Actually, a couple of years back, the acclaimed Chicago label Alligator Records released the American debut by Dave Hole, a hot blues guitarist from the isolated Western Australian city of Perth. The Mighty Reapers are from the Sydney, generally considered the Australian cultural capital. Trouble People is in fact the group's third release. The blues has become universal music, but regional styles have developed over the years in locales with active scenes. The blues from Memphis sounds different from Chicago or Texas-style blues. So what does blues with an Australian accent sound like? Dave Hole is very much influenced by the bruising electric Chicago variety and the rock-generation players who popularized the style. The Mighty Reapers, on the other hand, come up with their own distinctive but hard-to-place approach on the form. One can hear that their first influences are rock and jazz, and with a South African percussionist in the group, they add a vague world music twist. The style they favor leans toward the funky, with hits of James Brown in the tight, and often sophisticated horn arrangements that frequent the album, while lead vocalist Robert Susz is not exactly the Godfather of Soul, nor does he try to be. He sings more like a rock vocalist, and sometimes tends to be the weakest part of this otherwise outstanding group. On this album, however, American blues and soul singer Margie Evans sits in on the last three tracks and adds a good deal more authenticity. It's interesting to note that two of The Mighty Reapers' members overlap with the eclectic world music and jazz group The Catholics, guitarist Dave Brewer and percussionist Sammila Sithole, along with James Greening, one of the members of the Rufus Horns, who are a big part of this album's sound. Thus The Mighty Reapers' jazz influence becomes understandable. The other Reapers are bassist Vito Portolesi, drummer Antero Ceschin, and keyboard man Robert Woolf. The other two members of the Rufus Horns are trumpeter Miroslav Bukovsky, and tenor saxophonist Craig Walters. 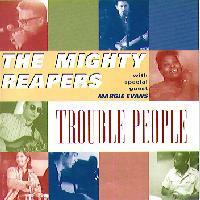 On Trouble People the Mighty Reapers serve up a combination of original music, their arrangements of a few standards, plus three of Margie Evans' songs, on which she is featured. With the growing popularity of the blues all over the world, the Mighty Reapers on their new album Trouble People, show that there's some pretty good blues "down under," in Sydney. While perhaps lacking some of that certain intangible quality that marks the really authentic blues, the Mighty Reapers instead add some excellent musicianship, with a manifestly jazzy quality, and an interesting combination of influences to forge a sound that is distinctive and original. While the group can't quite seem to get the slow blues right, their more upbeat tunes, especially those with a funky rhythm can really shine, especially with the subtle World Music touches added by percussionist Sammila Sithole and drummer Antero Ceschin's complex, jazz influenced approach. The horn section is also a strong asset on the CD, while guitarist Dave Brewer's classy playing reveals something new on each listen. Sonically, the album is outstanding. The recording approach emphasizing sonic clarity, is something of a contrast to the gritty sound often heard on American blues albums. Their album's mix adds to the airy, jazzy quality of the musicianship, and for me really enhances the record. Those purists looking for genuine, unadulterated, tradition-steeped blues are not likely to find a lot of it from this eclectic Australian group, but the Mighty Reapers' combination of superb musicianship, level of enthusiasm and wide-ranging influences provide first-rate listening for the open-minded blues fan.